Oreo can't stop, won't stop releasing strange new flavors. The latest wacky science experiments from Nabisco's basement laboratory of oddball ideas: cookie dough and marshmallow crispy. Why, cookie gods? Why? Oh, and they've also enlisted Tegan and Sara to make a big promotional push with a jingle about trying new things. YOU CAN'T MAKE ME, TEGAN AND SARA. The news comes from Time, which reports the limited edition cookies will debut February 3 and last for six weeks or so. The reporters at that august institution insist the new flavors are actually pretty tasty, and an ABC New correspondents backs them up re: the cookie dough, at least. 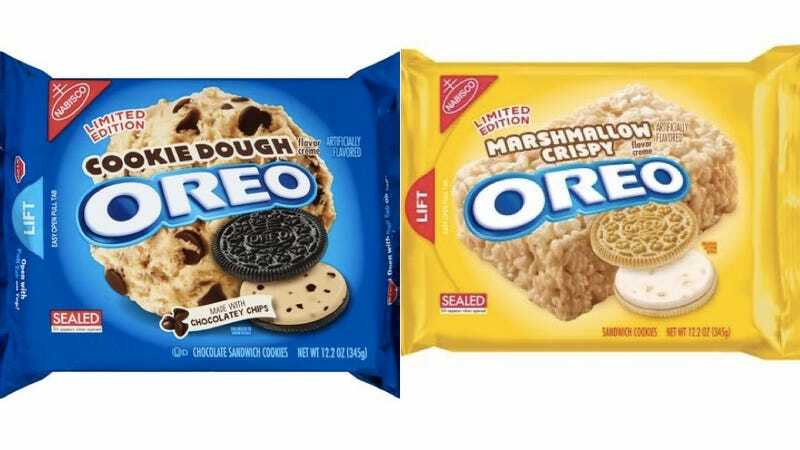 Not that they taste like cookie dough, exactly: "Several staffers said they got hints of coffee or caramel, and one said it should be renamed the Frappuccino Oreo." But that is neither here nor there. I don't care whether they're good or not! A line must be drawn. Do not encourage Oreo. The mad scientists at Oreo must be stopped before they go too far. Our own Lindy West has been assiduous in chronicling Oreo's crimes against taste, including watermelon and candy corn varieties. The hubris! This can only go on for so long before they do something truly unpardonable. Please, no more. No more.